Warning to Auntie Beak and other arachnophobes: this post is about spiders. I had an unusually high number of butterflies in my garden recently. They were mostly “American Painted Ladies.” Of course we also had, and continue to have monarchs and the occasional lingering tiger swallowtail. I think I can attribute the increase in butterfly action at least partly to the plants in my garden. 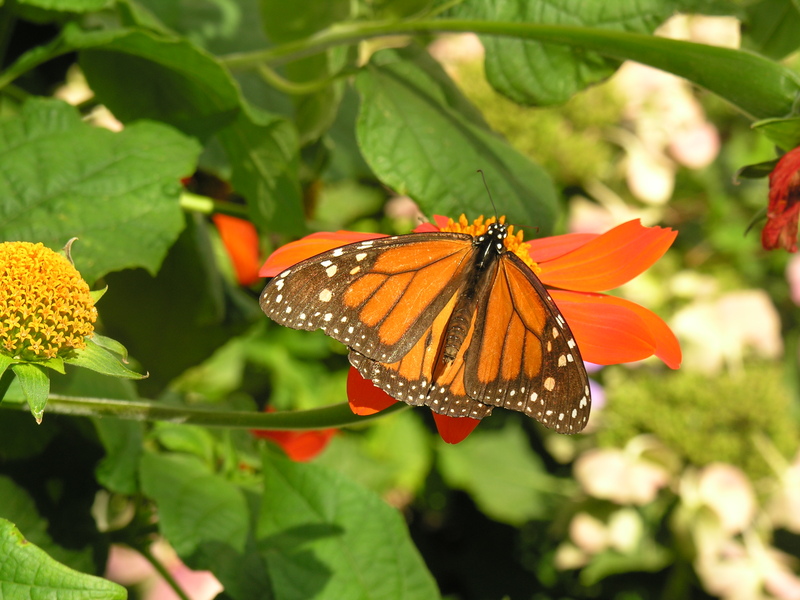 I try to plant with pollinators – bees, butterflies and hummingbirds – in mind. Tithonia “Torch” (Mexican sunflower) is a favorite, as are helenium (Sneeze weed) eupatorium (Joe Pye weed) and verbena bonariensis. 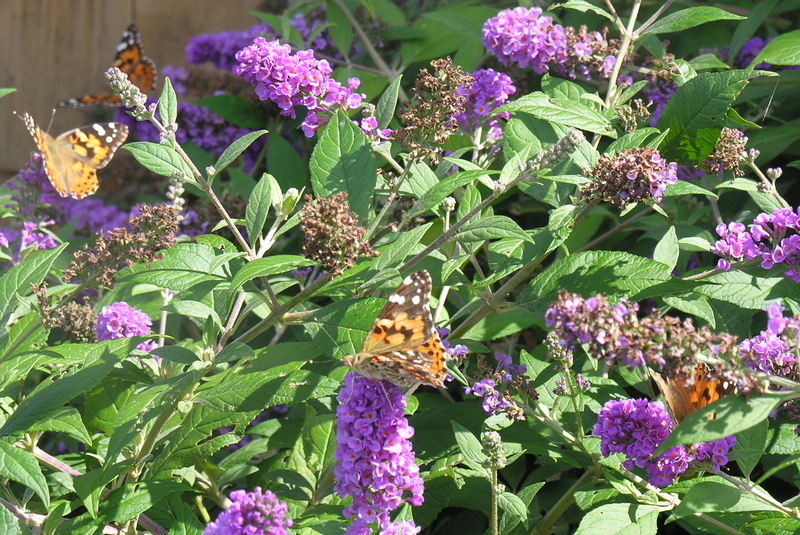 They went really crazy for the two “Blue Chip” buddleias I planted last year. They absolutely covered the bushes. 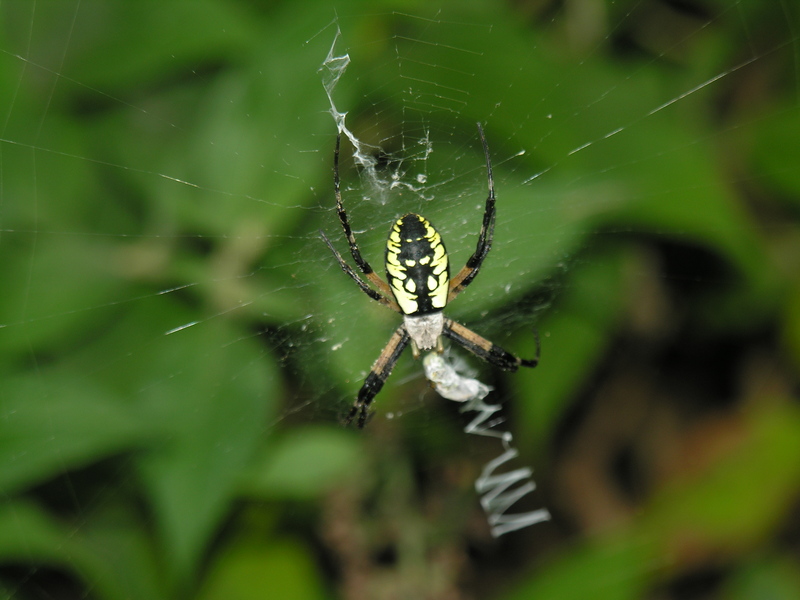 A large “Argiope Aurantia” or “Black and Yellow Garden Spider” built a web near the base of one of the buddlieas, and trapped and ate several butterflies and at least one bee. I had to take down its web to get through to the hummingbird feeders, but I didn’t try to harm the spider. I don’t think it is up to us to decide which wild things are “nice” or “mean,” and it annoys the heck out of me when other people do. I was hoping that the destruction of its web would send the spider somewhere else, solving my ethical dilemma, but when I went back out a mere half hour later, the darned thing was rebuilt. It wasn’t as showy as the original, but it was functional, and the spider was busy devouring a bee. There was another silk-wrapped meal (dessert perhaps?) waiting, the remains of a painted lady. After reading more about garden spiders and the potential for hummingbirds becoming trapped in their webs and dying, (!!!!) I scooped up the spider in a kitchen strainer and gently deposited it in another part of the garden, far from the hummingbird feeders. The next day, I saw that it had built a new web on one of the hydrangeas. The painted ladies have moved on. Apparently there was an irruption of them in our part of the country this year. It was cool while it lasted. The hummingbirds left all at once one night, although I am maintaining a couple of feeders for the stragglers. And the spider? No sign of it this week, not even the remnants of a web. Great story dirtynailz. I was interested to read that your hummingbirds have moved on. I wondered when it was time and thought my family was gone too until this morn when I saw one. Maybe he was a straggler. So I will continue to keep it fresh for a little while longer. I keep my feeders going right into October. That’s when the vagrants like the rufous show up.Last year, there was one in Westerly over Christmas! The homeowners kept the feeder going, but it would not have made it through an entire winter without protein for sure. A licensed rehabber trapped it, kept it all winter, and released it in May! We are inundated with spiders too, and I leave them where they are unless they’re in the way of a door! Unfortunately some of them decided that those monarch caterpillars were tasty, and they all disappeared over night. Like you though my feeling is that they have to eat also; it’s just nature at its best! I have two young female hummers left from the summer bunch so I’ll continue to refresh the feeder until they decide to move on. I thought monarchs and their caterpillars were toxic. I guess not – at least to spiders. I think you’re right that monarch caterpillars are toxic and taste terrible to most critters, but I’ve seen wasps and toads eat them as well as my cardinals who think of them as one big treat! I haven’t seen one of these spiders in years. They look intimidating because of their size, but they are quite beautiful. I’m glad you simply moved it to another location. They are beautiful, Martha. But I guess they aren’t so pretty if you’re trapped in one of their webs…. We usually have these garden spiders, but I haven’t seen any this year. One built a big web outside our kitchen door one year. I was at the sink looking out and saw a hummingbird fly into the web. My husband ran out and rescued the little bird who seemed in a state of shock. I think he accepted his fate. He was lifeless and still in my husband’s hands. Within a minute or so, he suddenly sprang back to life and flew from my husband’s hands. It was a miracle for the bird, my husband, and me, but a big disappointment for the spider. We took the web down immediately and the spider moved on. The are awesome spiders, actually, and talented artisans. We have an overabundance of spiders this year, but so far not a single garden spider. That’s a scene I dread witnessing, CJ. Thank goodness your husband was there to rescue the bird. I know the spider has a right to eat like any other creature, but I just couldn’t handle seeing one devour a hummingbird….. They really are beautiful and industrious! We never seem to see them until early September rolls around. I’ve rescued a couple of very large dragonflies from their webs and have often worried about the hummers. Glad to hear that you were able to save the little guy before he became lunch!